Update: Translated Color Guides and Manuals can be found here. A modelling kit will usually have symbols in their instruction manual right next to the illustration. Their purpose is to make it easier for modellers to understand what has to be done in this step as well as to save on space on the part of the manufacturer in having to type the instruction in the manual. 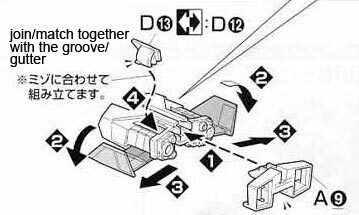 Most of the symbols in Bandai Model model kit manuals are generic to each other. Which is convenient because if you've seen one then you've seen them all and you can be assured that they practically mean the same thing. The symbols meanings are usually found at the bottom of the page for the newer model kits, while on the older kits its found in the first few pages. The downside is that they are written in Japanese. But fear not because this post will give an English translation of what those symbols mean. Part will be installed on the opposite side. Usually there will be 2 part numbers next to this symbol. Meaning that one will go to this side while the other will be placed on the opposite side. Similar part will be installed on the opposite side. This symbol will have one part number adjacent to it and this means that another one like this will be installed on the opposite side. Be Careful to not tighten it too much. This usually refers to the screws that come with the kit. Part to be cut. This usually refers to the gates of the plate. This procedure has to be repeated â€œxâ€ number of times because of the number of similar parts involved. So it also means you have to build "x" number of pieces of the same part. Number of degrees the part will be rotated opposite from its current position. Your choice to choose which part you want to install. Basically this tells you that there is the choice to build this another way. One common example of this in Gundam kits are with the beam sabers, where you are given the choice to build it with either the beam saber on or just the hilt. Another common example in Gundam model kits is that some kits can be assembled as the cannon-fodder variant or the commander type, depending on the parts you have chosen when you see this symbol. Opposite side will also move the same direction.